Top financial services organizations constantly explore new ways to extract value from their data to support business initiatives like attracting new customers or entering new markets. It’s important to incorporate new data sources and technologies into current workflows. You also need to respond to complex regulations and compete with market disruptors in today’s competitive environment. 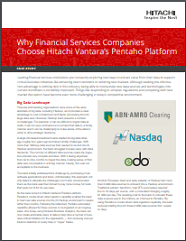 Read this case study to see why financial services companies choose Hitachi Vantara to navigate the big data landscape and answer risk and compliance challenges.